Rep. Dan Swanson with Logan Brinson on Illinois House Floor, March 21, 2019. State Representative Dan Swanson (R-Alpha) honored Logan Brinson, the pre-k “Rock Star” of “Logan’s Little Library” fame, in the Illinois House on Thursday, March 21, 2019. Logan joined Rep. Swanson in the Illinois House on Thursday fresh off being featured on Wednesday on NBC’s “Today Show” for his many accomplishments benefitting literacy in his community. Logan, a five-year-old student from Alpha, Illinois, took action when he found that his community of Alpha did not have a public library after he and he his family moved to town in 2017 by starting his own “little library” in the front yard of his family’s home as a way to share his love of reading with the community at large. The success of “Logan’s Little Library” led to the need for a second location in Alpha, recognizing that some children and families may not be able to easily cross US Highway 150 to access his first location; and Logan recently spoke with City officials in Rio about adding a location in the neighboring community as well. Logan’s hard work and innovative idea has led to over 2,000 books being donated to the effort from 24 states and 14 countries to date. Logan’s commitment to his community has not gone without recognition as local, statewide, and national news media and office holders have recognized his efforts aimed at increasing literacy and a sense of community, which is all-too-often diminishing in our modern times. 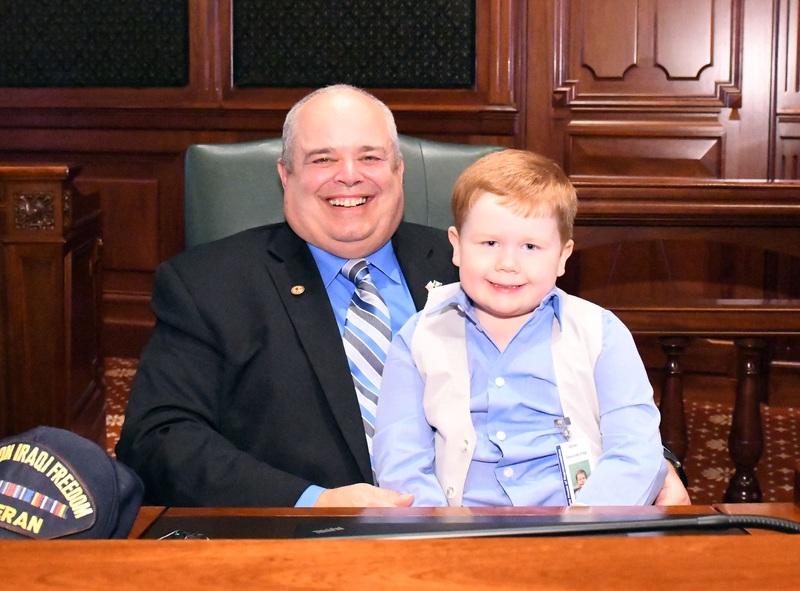 Logan served as an Honorary Page in the Illinois House on Thursday, as well as being feted with House Resolution 199 honoring his accomplishments. Logan is the son of Brandon and Leigh Brinson and is active in Soccer, T-Ball, and recently tested for his White Belt in Kuk Sool Won.